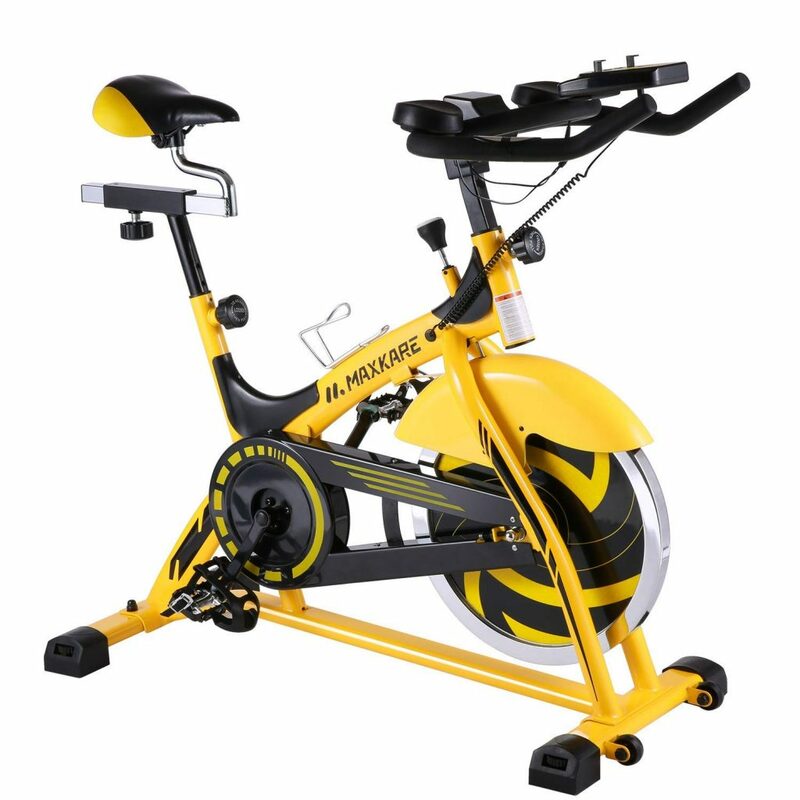 Yellow and black MaxKare Stationary Spin Bike has a professional and modern design for a great cardiovascular workout in the comfort of your home. It is a very newly released indoor fitness bike and only has 5 customer reviews on Amazon.com. Their average rating is 4.8 out of 5 stars, which is an indication of high satisfaction level. You shall enjoy quiet and smooth riding with its super-quiet and efficient flywheel and the belt driven mechanism. It will generate as little noise as possible and not disturb your family or neighbors while you work out. You can listen to the songs you like or watch the shows you want on TV. There is a smartphone or tablet holder at the front for your entertainment when you’re riding it. The yellow and black seat is thick and comfy with the very dense padding and this saddle and the handlebars are adjustable for height to accommodate people of different heights. The saddle can also be adjusted horizontally- the distance from the handles. 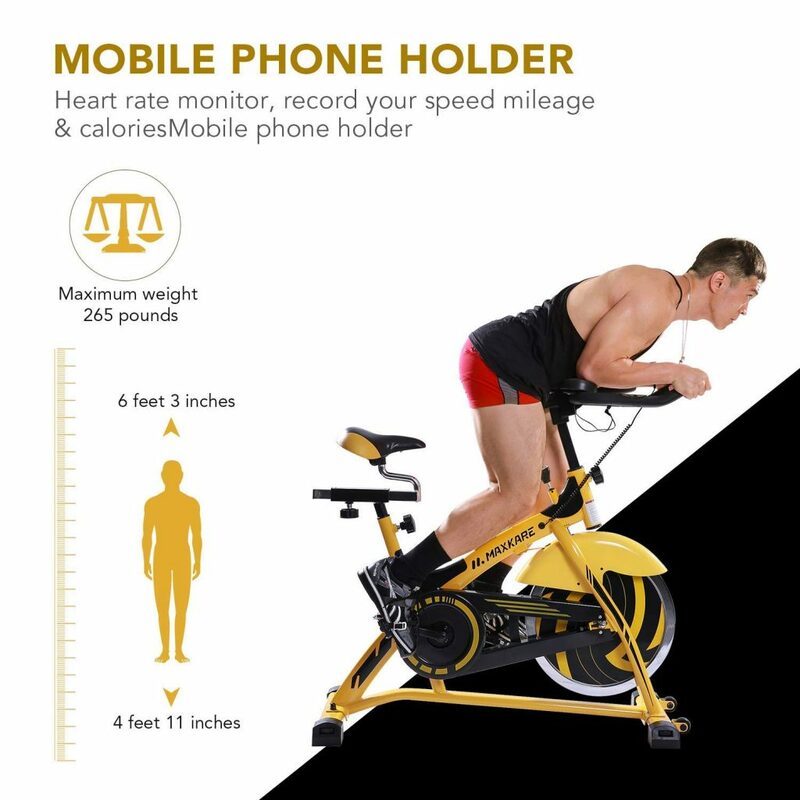 People between 4’11” and 6’3″ can ride this home spin bike comfortably as long as they don’t weigh more than 265 pounds. It has a non-polar resistance adjustment and a tension knob in the middle that can be used as a brake to stop slowly during the braking when you need to. The wool felt brake pads will help you ride smoothly. There is a standard smart LCD display panel at the front with the indicators of calories burned, distance traveled, current speed, scan and heart rate via the heart rate sensors on the handles. You can keep track of your stats and stay motivated while you’re riding the bike. It is shipped unassembled and you’ll get the tools and instructions included in the box. And once assembled you can move it on its front mounted transport wheels to a convenient location in your house. The MaxKare Spin Bike will help work on your different leg muscles including calves and thighs, as well as your core section- abdominals. And it will help you feel healthier overall. The pedals are adjustable and come with foot straps to keep your feet in place during your workout, for safety reasons. There is less burden on your ankles, knees and joints during a riding session than running on a treadmill, which means it is a relatively low impact type of workout. It has a sturdy steel frame and people that weigh up to 265 pounds can use it without any dramas. You’ll find a water bottle holder in the center and you can stay hydrated during your session without needing to dismount the bike. The MaxKare Spin Bike looks great in yellow and black and with a modern design, is easy to put together within less than half an hour, rides very well- smoothly and quietly, includes a decent accurate display panel, has a sturdy frame and is offered at a fair price.